EU Stress Test Results: Don’t Relax Just Yet! The European Banking Authority (EBA) conducted another round of stress tests that included 91 banks across 21 European countries. After last year’s not-so-convincing test, hotshots at the EBA made the one for this year test more stringent to boost investor confidence with 3,200 data points compared to last year’s 100. Banks were required to report on the bonds they held, citing their maturities and which countries they’re from. On top of that they also had to report on their commercial credit commitments. The EBA also tested banks if they could handle a contraction in Euro zone GDP, a rise in unemployment, and a decline in property prices. Analysts were bracing to see at least 15 banks fail the stress test that would require about 29 billion EUR in capital to be raised. So what were the results? Drum roll please! To everyone’s surprise, the EBA’s report showed that only 8 banks failed the test. Five banks from Spain, two from Greece, and one bank from Austria had capital buffers below the 5% passing mark that the EBA specified. Doing the math, all eight banks only need to raise 2.5 billion EUR. That’s 1 billion EUR short of how much was needed by the banks that failed in last year’s stress test! According to the EBA, a few capital-raising schemes from December 2010 to April 2011 allowed about 16 banks to raise about 50 billion EUR and pass the test by a hairsbreadth. Whew! However, even though the results were a notch above expectations, the market remains skeptical. Essentially, the markets believe that the tests were… well, pretty easy. In one of the “hardest” tests, the EBA tried if the banks would survive if joblessness was 11.6% in Portugal. The problem is, Portugal’s unemployment rate already stands at 12.4%. The EBA also failed to consider the possibility default from debt-stricken nations European nations like Greece. Given that a Greek default is a possible real-life scenario, it should’ve been a no-brainer to include it. If the stress tests were really stressful, the results should’ve showed that more than just eight banks need to bolster their capital! In fact, an analyst from JP Morgan believes that 20 banks, at the very least, need to increase capital to comply with the Basel III requirement which is for banks to have their capital ratio above 7%. The stress tests, rather than assure, has actually opened up a new can of worms. The stress tests revealed that the European banking sector is plagued by large amounts of residential mortgages, small-business debts, and loans to troubled nations. Yikes! The absence of a strong rally following the release of the stress test tells me that the market isn’t quite convinced about the results. Don’t get me wrong though, I think the amount of data that the EBA gathered makes it easier for investors to gauge the health of the European banking sector. However, that wouldn’t be enough to soothe the markets. If you ask me, unless the European Union manages to come up with a solid plan to prevent Greece from defaulting, the market will remain jittery and selling pressures on the euro will still linger. 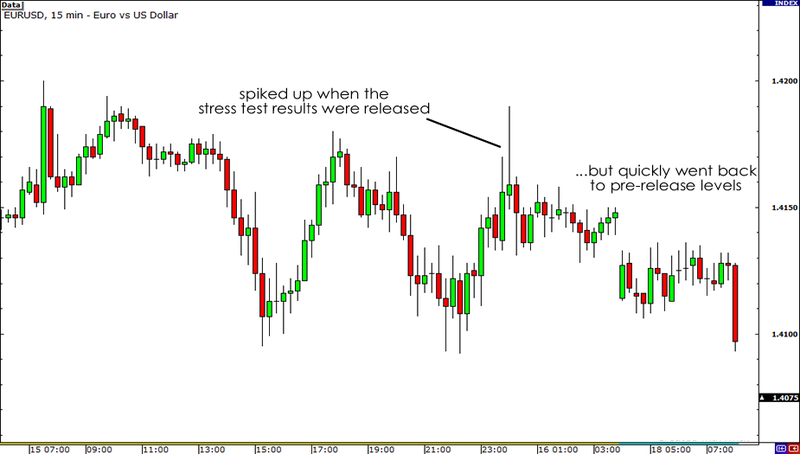 What do think will be the effect of the stress test results on the euro?